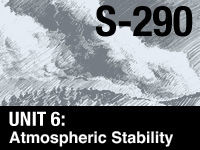 S-290 Unit 6: Atmospheric Stability introduces the processes related to stable and unstable atmospheric conditions and explains their impact on fire behavior. This Unit provides detailed information about how fire behavior is affected by stable and unstable atmospheric phenomena such as inversions and thunderstorms. The Unit also explains cloud formation and describes the usage of clouds and other visual indicators to recognize stable and unstable atmospheric conditions. The module is part of the Intermediate Wildland Fire Behavior Course "http://www.meted.ucar.edu/dl_courses/S290". Great learning experience! Well designed effective exercises with fantastic pictures and animations. It would be helpful if we were showed what we got wrong. Some of the exercises where labeling was required was difficult because I would drag a description to the photo and it would continually reject the response eventhough it was correct. I had to continually attempt to drag the description until I got it to the exact location on the photo. This is perhaps one of the most important units of S-290, but the concepts can be difficult to grasp. Take your time with this one, and don't take the quiz at night while you're falling asleep after studying...don't ask me how I know. Unit 2 - Cloud Formation: Review Exercises, Question 8 has an error. I selected B, clicked Done, and was told “The correct answer is B…” however answer B was marked with a red X while answer A was highlighted green, as if it is the correct answer.Unit 3 - Stable Atmosphere: Frontal Inversion, Question 2 (*not* from review Exercises) has an error. I selected B, and while the text told me this was correct, as did the green checkmark beside B, answer A was highlighted in green, as if it were also the correct answer.I’m fairly sure question 19 of 26 in the quiz is grammatically incorrect, and misleading. “If a cold front displaces… what will happen to its pressure…?” sounds as if you’re asking us what will change in the cold front, though I believe you’re referring to the air parcel instead. This course was very difficult with a lot of information overload. module was a little hard to follow, but is helpful. I learned so much. Very Interesting module! Good lesson but very long. There was too much information on this module to grasp and then test on. Too much information for one lesson. Necessary information with great visual aides. This is a great course. Thank you. A lot of Material for one lesson and perhaps a bit over the top for a firefighter but meteorologists would certainly appreciate the material. This unit needs to be broken down into smaller units. There was entirely too much information to adequately get a take away. Way too long for such a complex subject. This was well written for learning. Despite the long sections it contains they did a smooth job of repetitive questions to help you retain the previous information and to blend it into the upcoming topic of study. Too much science made the course dis-interesting and unnecessarily lengthy. Reading clouds is important for predicting fire conditions but I feel like there was too much back story for the facts presented making it difficult to focus on the course. Too much information in one setting. hard to fully understand and hard to follow as this unit is very long, too long in my opinion. several of the lessos were inclear making the quiz overly difficult. i have a learning disability and this was hard for me!! A little too in depth on lapse rates, etc.....IMO. Good variety of pictures and animations help put together the elements of atmospheric stability, making it easier to understand storm behavior and weather warnings you may have noticed on wild fires. It would be nice on the questions that were wrong on the quiz would show the right answer as well as the wrong one so you know what or how you got it wrong. Buckle up, there is lots here to learn. I would add section quizzes that must be passed to progress. To ensure learning. I passed the quiz, but Im not confident in my knowledge of this material. Its a lot to take in. Test has some pictures that could go either way and there therefore we hard to pinpoint an exact answer. The lesson was too long. The inversion sections and cloud sections should have been individual units, that you did one after the other. Understanding would be improved by separating the topics and then having a section where you showed their interaction. Additional review questions in each section would also be helpful. Can't think of anything to change. thunderstorm info was great but I feel a lot of stuff could have been left out like the thousand example questions. that got annoying but the rest was awesome! need more slides for practice so learner can be good at recognizing elements. It was great, Interactive videos and text. Able to learn with all the interactive ways. Good exposure to atmospheric stability beginners. There needs to be more time spent defining terms and noting the distinguishing factors of each. I'm still not sure about the DALR, MALR - I have to research that up. The length of the lesson made it difficult to stay focused. I would recommend separate, shorter quizzes for each section for better comprehension. This was a lot of information, and the pictures used could be a bit ambiguous. It was very time consuming but there was good information. This was the most tedious of the units so far. Take your time and be sure to go through all exercises and videos. Lots and lots of data, sometimes confusing. The learning part was good and stuff is well explained, but summary charts or something are really needed to put all the pieces together. Hard to remember all the elements described in this section - need a good reference document/sheet. u make the quiz's answers hard to find!!!!!!!!!!!!!!!!!!!!!! !and make the lessons to hard to understand make it simple !!!!!!!!!!!! While this lesson did help deepen my understanding of weather conditions to look for as a firefighter, the format was not the greatest. I would have preferred to take this unit in a classroom setting where I would be able to ask a teacher questions and have open discussion with others. Too long. needs to be split in two. Some of the content could use more explanation. I think this course should be taught in class. he pictures are not great and its hard to figure out what your looking at. I feel that some of the material could have been explained in simpler terms, which would have made it much easier to understand. I do not like that the page will change as soon as the audio is done. Also I normally cant just go back a page. if I hit the previous button I never know how far back it will take me. These are problem in all sections. "Which of the following statements best describes an inversion?" this question is not easily answered and still does not make sense to me... The "What is stability?" part of the lesson was too technical for my purposes. It should be be less technical and easier to understand. It even says in the lesson this is what "meteorologists" use and do.. Firefighters just need the basic understanding and then have drop down for extra learning about the subjects for more details. The rest of the lesson was alright but hard to follow because I was still trying to understand the first part. Course was very well done. Leaned a lot from it. I just hate weather so I'm staying neutral on this unit. too long, very poorly explained, cloud types not well defined. This lesson was a little more difficult than the previous lessons. There was much more to it. It was broken down to help with the understanding, however the first section was very difficult to follow. I felt many of the subjects were poorly explained. Especially air parcels. It would say, "if one parcel of air rises relative to another air parcel..." why would they do this? What is the difference between these two air parcels that would cause one to rise and the other sink? A little more explanation would be beneficial. Additionally I felt that some of the pictures of clouds were insufficient. They failed to show the whole picture and therefore made it difficult to reach the desired conclusion of the lesson. This lesson was particularly difficult for me to understand, and took a bit of re-reading to grasp some of the cloud formation concepts it presented. More difficult to navigate site. A nice recap on things I forgotten during college. this has to be the worst test given. why are there some questions with up to 6 answers? on the face of it there are 26 questions but more than half of those require a multi-part answer. that's ridiculous, break the questions up. There was a whole lot of information in this lesson. Maybe consider splitting it into two units? seemed to be very overcomplicated. Overall this lesson raised more questions than answers. There were some images where the student needed to classify things that were kind of obscure. This was a lot of information at once and it was quite dense. Unit is too long. Should be broken up. I felt that The information in the course itself did not really help out with the quiz. This unit had almost too much information to absorb for one test. Nearly overwhelming, I did manage to get through it but it was the toughest test so far. Very informative, the quiz was very challenging! Too long, a LOT of information is put to you. Would possibly help to separate into two units. This section took too long. I woke last night to the sound of thunder. How far off I sat and wondered. This is a class that requires better explanation and not asking questions before the teaching is done. This is a college level course compressed into a few slides leading to mostly memorization and a weak understanding of the intricate concepts at play. Good lesson, but was a bit much too crammed and tough to grasp concepts. Good easy to understand description of lapse rates and stability of atmosphere. New insights into inversion layers. It is useful information but would take me a lot of time to fully comprehend and retain all of this information. why do i have to complete the survey every time? I had some trouble with one of the matching activities (clouds and atmospheric stability I think?) otherwise great module, I learned a lot and it helped solidify some information that I've been having a hard time with. Good class information wise. It's unacceptable that people have found an error with photos on the final test and that it hasn't been corrected. I used two different browsers and had to completely guess on questions that required photos. I passed so I guess I'm good at guessing! it long. The questions that had multiple pictures would not load so made difficult to answer question. If given the option try old format before new. Photos necessary for Unit 6 Quiz failed to load on questions 17 and 20 perhaps a third when done in the new suggested format. This could be make or brake in your passing the quiz. Topics here were covered well by comparison to other Met. classes I've encountered outside of Comet. Moving diagrams are not always available in lectures/online courses as they are found here. Concepts are still tricky and require repetition to grasp.. A couple photos don't represent concept well and could cause some confusion, but overall I thought media was better than I've seen elsewhere. Me ha gustado mucho esta unidad. Toca materia que no conocía y que me aportan otra visión de un incendio. Eso si, es más para un técnico o un director de extinción que para un combatiente. Terrible explanations, videos skipping past important parts, and all too condensed overall. It would have been nice if the content and the test had anything to do with each other. This unit was terrible. As a Firefighter this was WAY too much info that I will never use in real life. This should be more geared towards what we would really do it would be much better. This course seems like this would be more for someone who wants to be a Meteorologist not a FF. A lot of good information, but very time consuming also. This unit should be broken into the 4 sections, or at least 2 to be more digestible. Also videos were confusing, and did not seem to represent the phenomenon as well as the animations. Did GREAT during all the practice quizes throughout yet only scored a 76% on the actual quiz! Really? I know most of the information I had viewed. (You have to click "continue" or "Next question" instead of "Next." If you click "next", it will pass over quite a bit of essential information. Needless to say, this quiz/unit alone brought my Average down to an 88%... unacceptable in my book! Other than the complications, most of the material is quite informative. I actively participated and learned during the unit, and I got every practice question right during the module, yet only got a 77% on the final quiz? I do not like how the quiz is scored and laid out. Very long and informative, but the pictures could be a little better, and the questions could be more direct. A very comprehensive module on weather.The best I have taken. The exercises really made me think and brought the learning together. I don't see why this module would get a bad review. I found it very informative and easy to navigate, as long as you follow the directions given. Yes, it is a little long, but there is a lot of information related to the topic that needed to be understood. Good stuff. This is a great module and I recommend it to any one wanting to learn more about cloud and inversion formation. It is very easy. As for being longer, 3 to 4 hours to complete, I just took two days to complete it. As for "awhite28"'s review, they just clicked next and not the tabs at the top of the page. They tell you all about thunderstorms and inversions. I do not know why this module has so many bad reviews. It is the best module that I have found on clouds. It is very easy to understand and has all kinds of pictures of what they are talking about while they are talking about it. Please disregard all the bad reviews about this module and take it yourself. Just remember, spread it out over two days and don't forget to click on the tabs at the top of the page. I am training to be a meteorologist and this is the only module I have found so far that describes the clouds so well. It is one of the best modules that I have taken on the whole METED site. i have to agree with the unit being broken into more and much smaller units, it also seems you put less emphasis on thunderstorms in your lecture and more focus on it during the quiz. Literally, there was a picture showing frontal inversion in the module and SAME exact picture in the test - which I answered frontal and it was incorrect? Really?? VERY, VERY long and segmented out makes it even more confusing. Reviewed September 15, 2013 As others have said, this unit really needs to be broken up into smaller units. This would assist us in better learning the materials. Many of us taking the course in work environments where we are interrupted, and the length of this unit makes it difficult to come back to the place you left off. The material presnented is good, and worth learning. Good section, all useful information, not as hard as everyone is describing. This unit is long, but the great thing is that there are these tab thingamagigs that allows one to go back over the information. Don't think you will be able to blow through this, take it slow and serious. Prepare yourself for this unit. Very long and dry. Yeah, what they said. this unit blows! Couldn't agree more with the two comments before mine. This section has a lot of information. Should be broken down into smallersections. I agree with dalenjffs. Great information, but needs to be broken down into smaller sections for the quiz. A lot of important information covered and should be broken down to be able to focus on it all. This unit is to long with all the information that you have to know for the quiz. It needs to be broke down in sections for the quiz to be taken. This unit has alot of information that is vary useful. Explain the relationship between atmospheric pressure, temperature, density, and volume using air parcels. Describe environmental lapse rate and stability, and the different lapse rates used to determine the stability of the atmosphere. Describe the effects of atmospheric stability on wildland fire behavior. Identify four types of temperature inversions and describe their influence on wildland fire behavior, including the role of the thermal belt. Name and describe the four lifting processes that can produce thunderstorms. Describe the elements of a thunderstorm and its three stages of development. Use visual indicators to determine the stability of the atmosphere. Describe the four principal cloud groups, and identify the six clouds most often associated with critical wildland fire behavior.